Hi there! It’s sample time again today. 🙂 I’ve had this Clarins Double Serum sample for ages. 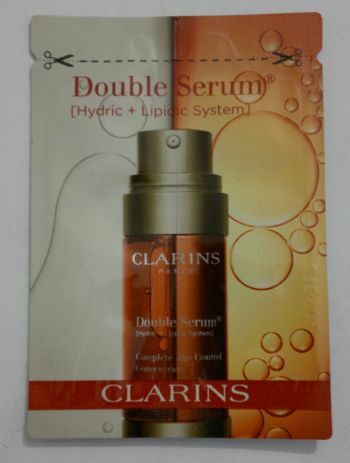 I was reluctant to try it because I once suffered a horrible reaction from using a different high-end serum (different brand), and a few (literally a few) reviewers who tried this Clarins Double Serum reported unpleasant skin reactions. But I’ve now finally tried this serum – and I made sure it wouldn’t get anywhere near my eyes. And as soon as I had applied it, I washed my hands right away – just to be on the safe side. The serum didn’t irritate my skin at all. So my worries were unfounded. But the serum didn’t do much for me. I’m used to creamy serums which make my skin feel velvety in an instant. So I’m not in love with the thin formula of this serum. And I didn’t like that the serum became sticky while I was still smoothing it into my skin. But that’s down to personal preference and the next lady might love this formula. Now back to why the serum didn’t work for me. OK, the serum claims to to make pores less visible and to target skin ageing in general. I acknowledge my review is based on a single use of this serum, so I can’t comment on its long term benefits. But I found that it actually made my pores look bigger than usual. I also thought the serum could be more nourishing. I’m not saying it dried out my skin, but I put on moisturiser three times today because my skin felt less soft and supple than usual. So based on my experience (a one-off use of this serum) I can say for sure I won’t be buying the full-size product. Clarins Double Serum may work fine for ladies with different skin types, and it may even be the best wrinkle-smoother in the world if it’s used long-term. But I won’t be spending £56 on the full-size product just to conduct a more extensive trial on a product I really didn’t like in the first place (runny, then sticky texture, not nourishing, made my pores look bigger). Have you tried this serum? How’s it working for you? Is it the holy grail serum for you if you use it regularly? Please share your experience with me. 🙂 And thanks for stopping by!